Coral Castle is one of those quirky and charming attractions that you can find across the United States. The location isn't the best and the attraction is kind of small, but it's beautiful, interesting and unlike anything you've ever seen. 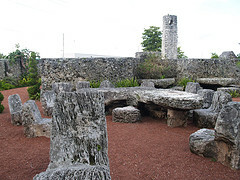 A tour guide will lead you around Coral Castle looking at the carved "coral" statues and objects. Each tour guide brings there own bit of personality to the tour so your visit will be slightly different than everyone else's. Admission is $15 for adults which might be a little steep, so try using the Go Miami Card to save a few dollars. Give it an extra star if you enjoy ancient monuments, historical artifacts, quirky, or supernatural exhibits. Coral Castle, located just outside of Miami Florida, is one destination that everyone should see in person. But think of it more as a rock garden of gigantic proportions rather than an actual castle. This magnificent site has been features on That’s Incredible, In Search Of…You Asked For It! and Ripley’s Believe it or Not. Even Billy Idol’s hit Sweet Sixteen was written about the lost love that inspired Ed Leedskalnin to create this awe inspiring dedication to this one true love. Edward Leedskalnin was born in Riga, Latvia on August 10, 1887 and at 26 he was engaged to be married to 16 year old Agnes Scuffs, his sweet sixteen. Unfortunately, Agnes apparently didn’t feel the same deep love for Ed that he felt for her and the day before their wedding she canceled the affair. Ed never recovered from this heartbreak and began his quest to create a monument to their love, and one can only assume he wished to one day win her back with his remarkable creation. Ed Leedskalnin was a slight man at only five feet tall and a scant 100 pounds. His size is part of the reason Coral Castle is so awe inspiring, but the other and more remarkable part is that he single handedly built the castle, carving and sculpting move than 1,100 tons of coral rock without the use of any large machinery. People have surmised about how he could have accomplished this with simply handtools and no assistance some have even gone so far as to explain it was a secret of the ancient Egyptians or magic but whatever the method, Ed not only built the incredible castle, he also had to move it 10 miles in 1936 when he learned of a planned subdivision moving into his neighborhood. Ed did the loading and unloading at night, in private most of it at night by lantern to protect his privacy. A bit paranoid, he had several lookouts along the castle walls to make sure no one was spying on him. 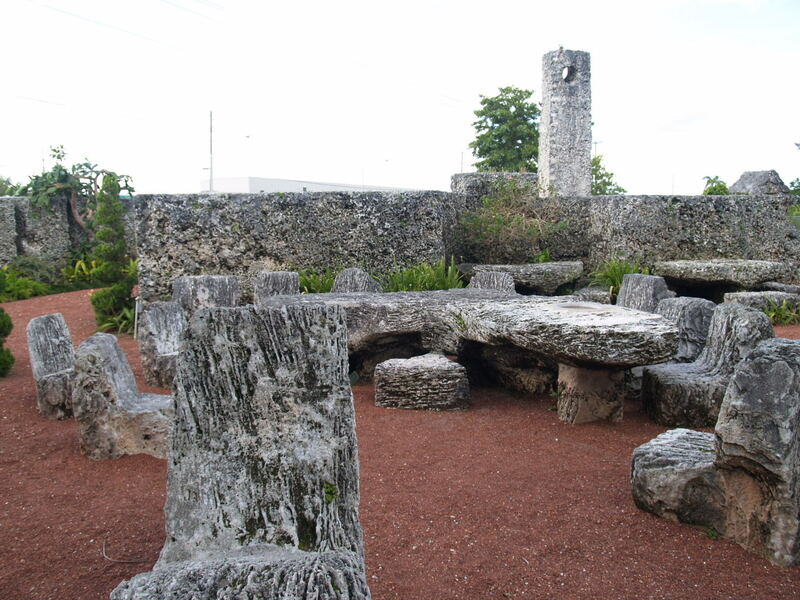 By 1940 the entire Coral Castle was moved to its new, and current location. Ed then walled off the Castle with coral walls that weighed 125 pounds per cubic foot, each wall section is 8 feet tall, 4 feet wide and 3 feet thick, meaning it weighs more than 58 tons. When asked how he accomplished the move and the construction of the walls Ed would simply understand that he understood the laws of weight and leverage well. 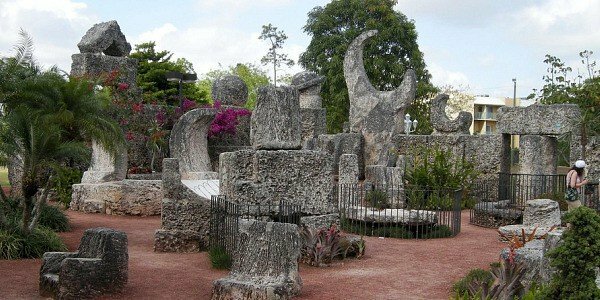 Although it is colloquially referred to as coral, the rock used to create Coral Castle is actually oolitic limestone, a sedimentary rock layered with grains and carbonate as well as fossil shells and coral. It’s a common stone throughout all of southeastern florida and is easily accessible as it often lays under only a couple inches of topsoil. Ed harvested his coral rock from the ground beneath his original home and the new location. Another one of Ed Leedskalnin’s architectural marvels is the fact that the stones are not mortared together or fastened in anyway, it is their sheer weight alone that keeps them in place, and the fact that no light can be seen passing through the joints is amazing enough, but in 1992 when Hurricane Andrew hit the structures head on not one stone shifted while entire structures nearby were leveled. Although the term castle is thrown about it’s the features and carvings in the park that are noted and often discussed. The two story castle tower is most likely where the name of the park came from, but this area also served as Ed’s living quarters. There is an accurate sundial, a barbecue, a water well, a bathtub, beds and a fountain that may have been of use to Ed on a regular basis. But he also had some more frivolous accessories with a Polaris telescope, an Obelisk, several sculptures of celestial bodies and furniture that included a heart shaped table, a table in the shape of florida, 25 rocking chairs, a number of crescent moon chairs, and a royal throne. But despite the odd collection of furniture and other sculptures throughout the park it’s the revolving gate that gets the most attention. Weighing an estimated 9 short tons, this gigantic slab of oolitic limestone is carved so perfectly that it fits within a quarter of an inch of its walls on both sides and its so perfectly balance that anyone can open it with the push of a finger. In 1986 the gate stopped working at a team of engineers and heavy equipment was called in to take the gate apart and determine the problem. It appears that a simple truck bearing that was holding the weight of the truck had begun rusting. New bearings and shaft were installed but the gate failed in 2005 and subsequent repairs have left it without the ease and precision it once had developed under Ed’s skillful hands. Although Ed Leedskalnin was a wonderful host, only charging visitors 10 cents for a tour and coming down personally from his living quarters to give the tour when he was able, he still would never disclose the secrets to his design nor state specifically why he built the Castle, except to say that it was for his Sweet Sixteen. Ed died in 1951 at age 64 and his testament to Agnes Scuffs has stood as his lasting impression ever since. Since Ed had no immediate heirs the property was transferred to a nephew who lived in Michigan. There are two reports of what then happened to the property. One report says that the property was sold by this nephew to an Illinois family but the other story comes from one of Coral Castle’s previous owners, Julius Levin who bought the land from the state of florida and may not have even known the Castle was on that parcel. No matter which case is true, the castle was actually renamed (it was originally called Rock Gate Park) and turned into a larger and more advertised tourist attraction. In 1981 Julius Levin sold the castle to Coral Castle, Inc. for $175,000 and the company still runs the property. In 1984 the site was added to the National Register of Historic Places. 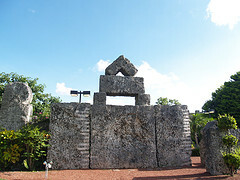 Coral Castle is open to the public Sunday through Thursday from 8am to 6pm and Fridays and Saturdays from 8am to 8pm.